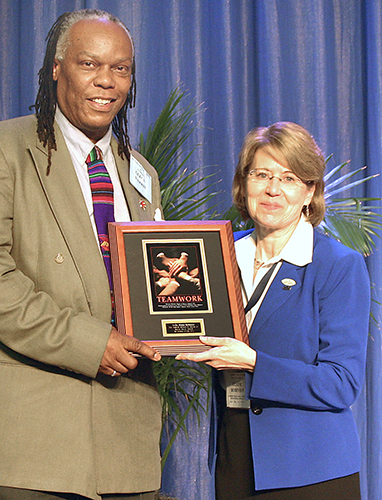 <<< Elaine Robinson, right, accepts the second annual Bishop Robert E. Hayes Jr. Racial Unity Award from Glenn Harris, who chairs the Commission on Religion & Race. Rev. Dr. Robinson is dean of Saint Paul ­seminary at OCU and attends OKC-Quayle UMC. A delegation, including babies, from Mount Zion UMC displays the "Outstanding Town/Rural Church" award and Bible given by the United Methodist Rural Fellowship. More than half the rural congregation is younger than 50. Bible studies and an accountability group develop discipleship; prayer walks are held in nearby towns. A softball league’s sportsmanship trophy is named in honor of the church’s team. Therapy dogs are part of one outreach program. <<< Patti Ralston of Sharon UMC accepts an "It Worked for Us" award for the church’s "Mission of the Month" program. With her are Woodward District Lay Leader Mark Gray, left, and Superintendent David Burris. Sharon UMC donates to a different local project each month. Cards and stamps assisted a military mail effort; baby supplies went to a pregnancy center. Books went to the school library, UMCOR received health kits, and the food pantry has benefitted. 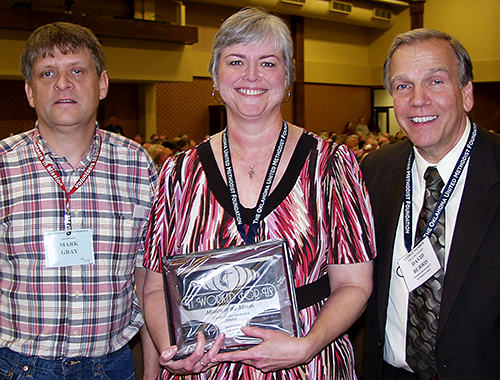 Excellence in ministry at all levels was formally recognized through award presentations at the 2011 Annual Conference, in late May in Oklahoma City. More than 50 churches received the new All-Star award from the Mission & Service Ministry Team. A representative of the denomination’s Advance honored the Oklahoma Conference for donating more than $1.2 million through that avenue of second-mile giving. Scouting Ministries commended Jim Hagar of Edmond, Torch Award; Edmond-First UMC, Shepherd Church Award; and Claremore-First UMC, Bishop’s Award of Excellence. The Board of Laity honored 13 churches with "It Worked for Us" awards, presented May 31 during the Celebrate the Laity Luncheon. These annual awards honor a church in each district for an outstanding lay-led ministry. This list of project titles hints at the wide-ranging faith work under way across Oklahoma. 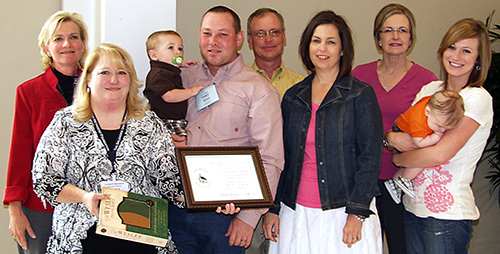 The Oklahoma chapter of the United Methodist Rural Fellowship honored six churches. "Outstanding Town/Rural Church" awards were presented by President Claudean Harrison at the fellowship’s luncheon June 1.